8. Which of the following best expresses the main idea of the passage? In order to understand Twain’s novel, critics must compare its protagonist to Oedipus. Twain’s novel contains some chapters that resist easy inclusion into a unified interpretation. The unconventional structure of Huckleberry Finn indicates a lack of authorial awareness. Twain’s novel was the first major American novel to discard traditional European structures. 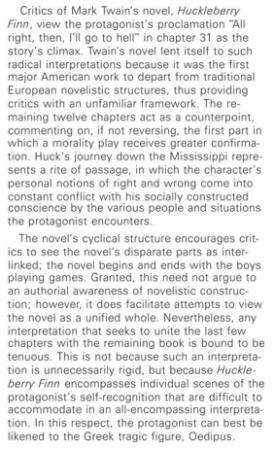 The protagonist of Huckleberry Finn is considered a modern day Oedipus by critics. 9. Consider each of the following answer choices separately and select all that apply. 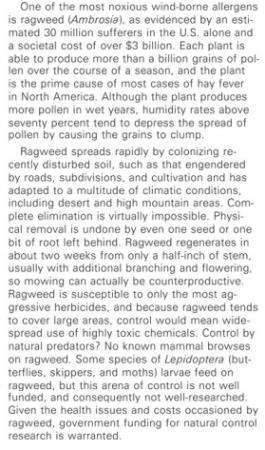 Which of the following can be inferred about the spread of ragweed pollen? Ragweed plants adapted to desert and mountain climes tend to spread fewer grains of pollen than do plants in other locations. Some attempts to control it may exacerbate the problem. The clumping of pollen grains caused by high humidity levels affects the ability of the wind to carry the grains.